Who says you can’t have your chips and eat them too? 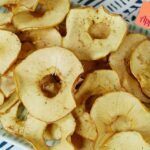 These nutritious apple chips are an easy, healthy new way to think about snack food. Slice apples as thinly as possible (I use a mandolin). Place on a greased baking sheet (or use a silpat). Bake at 225 degrees F for one hour. Flip apple slices over and bake for 1 hour more.